One of the most popular kitchen herbs in the world, rosemary is one of the first perennials herbs added to most vegetable gardens. Rosemary can grow into head-high bushes where winters are mild, but temperatures below 15 to 20°F (-6 to -9°C) can kill the plants. But cold is not the only problem a rosemary-loving gardener is likely to have. Five species of powdery mildew are known enemies of rosemary, particularly plants that are kept indoors. In addition, deceivingly beautiful rosemary beetles are surprising gardeners in the UK with their herb-hungry appetites. Frozen soil usually spells the end for rosemary plants, though several varieties have shown good winter hardiness at the National Herb Garden in Washington, DC. Simply adding mulch may be enough to help the most cold-tolerant varieties though moderate winters, but I have had much more luck by bringing the plants indoors. This is easy to do if you grow a plant in a sunken pot through summer. In fall, the pot can be lifted, cleaned up, and brought indoors in a matter of minutes. Whether you have a plant you have lifted from your garden or a fragrant rosemary tree youíve adopted for the holidays, be prepared to see patches of dusty white powdery mildew pop up as winter advances. This fungal disease is encouraged by the warm temperatures and limited air circulation of indoor life, so try to find a very cool, drafty spot for indoor rosemary. Plants may be happier in a chilly unheated garage than in your warm kitchen. Native to the southern Mediterranean, the green-and-purple striped rosemary leaf beetle made its first garden appearance in the UK in 1994, and has since spread throughout most of the country. Groups of this metallic beetle can strip leaves from rosemary, lavender and sage, and they will occasionally eat thyme plants, too. These beetles can complete their life cycle right in your garden (they pupate in soil around plants), so keep a sharp eye out for these unwanted visitors. The adults are active from spring through fall, when gardeners are advised to shake them onto a sheet or open umbrella for collection. Or, try the method we Americans use to collect Japanese beetles, which is to shake them into a shallow pan of soapy water on cool mornings. Wet beetles canít fly away, and the soap cripples their ability to swim, which makes for more efficient collecting. "I have a question about bringing rosemary indoors. 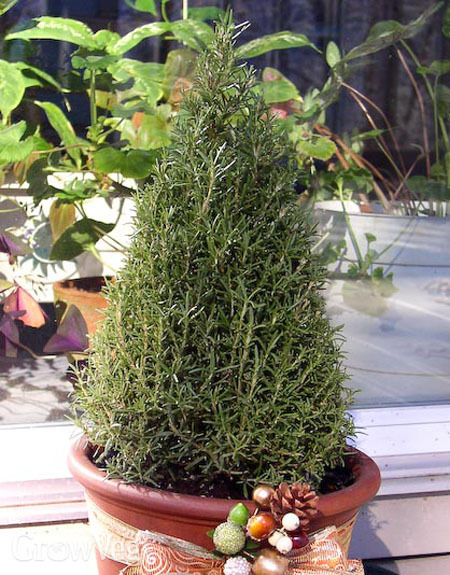 I just brought my potted rosemary inside, along with several other potted herbs (lemon verbena, chives, etc.). Within two weeks, it was DEAD. I mean, "crunchy leaves falling off" dead. None of my other plants were so affected--even the tropical plants right next to it. I water everything at basically the same time, too. It was vigorous and healthy when I brought it in. Any idea what went wrong? The window they're at is a west-facing window, so it gets late afternoon sun, perhaps not the strongest--could that be the problem? Thank you very much!" "The same thing has happened to me repeatedly. I've tried different sun exposures also and tried different amounts of water, watering from above and watering from below, but I've never had a plant survive the entire winter. Some have made it a few months. Others die right away, but they all die quickly when they go. One day they will be supple and green and the next day they will be hard and crunchy. This summer I planted them in a flower bed and they did beautifully. They have survived some hard freezes so far with mulch. I will probably add more to see if they can survive our winters. Some are mild and some are harsh but usually the very cold weather is short. I accidently broke a branch when I planted one of the bushes and put it in a glass of water. It rooted and I potted it. So far it's doing fine. I'll see what happens this winter." "So sorry to hear of these rosemary tragedies. I think the problem is keeping the plants warm and growing when they would prefer to be cool and semi-dormant. I leave mine out in the fall cold until the last possible moment, and then place it inside near a basement window. It's cold down there, but great for rosemary in winter. I also prune the plant a bit, and place a few stems in water to root. As long as they are in a dark-colored vase that blocks out light, stems that strike roots are ready to pot up in a couple of months. " "Thanks for the great information, I too have lost several rosemary plants, just thought it was my fault. Will move two rosemary plants I brought in down to the basement today. And I'm going to try the propagation. " "I didn't know they needed a dormancy period! That's good to know. Thanks for the advice." "Great info--I didn't know they needed a dormancy period either! Thank you! " "My rosemary plants have met their demise. They still smell wonderful, though....how do I harvest the dead leaves? Can they still be used in any way? THANKS for sharing your expertise! " "Sara, you can strip off the best leaves and let them dry a bit before storing them in an airtight container, but their flavor will not be as good as leaves harvested in summer, from plants that are robust and healthy. But I do think that messing about among dried herb stems is a wonderful thing to do in the middle of winter. I often leave a few basil plants standing, and crush their blackened stems when I want to be reminded that summer is coming back around again. " "I wish I could put a photo on this page because I have never brought my rosemary indoors in fact in sit in the garden and has for years I live in Washington state while not as cold as back east we do get snow and frost and lots of rain and yet my rosemary just keeps growing. " "I have a rosemary bush outside in central Florida. Parts o fit are dying and have brown small beads on the stems. Is this a fungus? Thanks Larry"
"Larry, please remove a few brown beads to see what they are. Could be seed pods, could be some kind of scale insect. In Central Florida, strange things happen. As long as you can find a few healthy stem tips, you can root them in damp soil or water and start new plants." "Hi, being a total plant novice, and a guy, (double dumb), I hope this doesn't seem too totally dense...I brought my rosemary indoors after the first couple of frosts in September. Sits in a window, sun only to 10:00AM, Avg 70 deg F. You said "Should you see powdery white patches on some branches, promptly prune them out and then spray plants with a mixture of one part milk to five parts water. When applied in bright light, the milk acts as a short-lived fungicide. The milk solution wonít work on all plant diseases, but it works great for outbreaks of powdery mildew on rosemary kept indoors in winter.††† My question hinges on advise I saw elsewhere that suggested that I should also re-pot the rosemary in fresh soil, as well as washing the roots, Is this necessary? D'ya think the milk water mixture works when watering, (no light to the roots of course), or if another stronger milk product like yoghurt might work in solution in the same manner sans light? Should it go in the basement, cooler very low light? Do I worry about the white powdery dust (spores I suppose) that flew around as I pruned the plant, will this infect other plants in my home? Answers to any of the above appreciated, D "
"I would not stress the plant further by repotting it at this time of year. If you can nurse her through for a few more weeks, do a bit more pruning to balance the look of your rosemary plant, and put it outdoors. Rosemary powdery mildew is not contagious. Any dairy product you can mix with water will set back powdery mildew, which is impacted by the interaction of sunlight with proteins in the milk mixture. Good luck!" "Michigan is too cold for Rosemary, hence, I bring it in. I also mist it every week. I don't get powdery mildew (white growth of fungus) but I do get some sort of blight by March. The leaves loose their deep green color. This is when I start to see a residue of some sort around the perimeter of the floor on which the pot stands. I've had this large rosemary bush and thought it was a goner the first year Inoticed this phenomenum. I take it out early (end of march) to temper and in April give it a bath once a week with tepid soapy water. By the end of May its all aglow with bright green leaves and growing tendrils at the end of each branch." "I have two large, 5 year old rosemary plants here in NJ, which have a problem much like what Larry described above. Much of the plants are dying off, and the oldest stems (usually over 1/4" - the new growth, even 2' long, has no sign of the scales) are coated with what look like a scale insect, yet I can't find anything in the scales when I dissect it, STS. I trimmed a very large amount of the plants away today - the dead parts, plus all the rest loaded with the scales, though there is still a lot left. Both were flowering a lot, on the areas I trimmed off, so they must have been stressed - reminds me of a very old plant before it died, so I am already starting some new ones. " "My rosemary plant is about 3-4 yrs old. I live in the Washington and it is planted outside. I clipped a few stems to cook with this morning and noticed some kind of bug on the under side of the leaves. The plant looks totally healthy. They are tiny rust/brown colored things that look are about 1/4th the size of a pin head. They wash off so I am assuming they are not an egg of some kind. Anyone have any ideas what they are and how to get rid of them. I don't want to put an insecticide on it. It is planted next to Daliahs and tomato plants. " "Sherri It sounds like either they are aphids or spittle bugs but in either case you just drench plants with strong sprays of water from a garden hose to kill them. (A hard, driving rainstorm will have the same effect.) "
"David is right, they sound like aphids or other small sucking insects. If a few strong sprays of water don't get rid of them, you can try a very dilute soap spray on a cloudy day. Rinse off the soap residue after a few hours to reduce the risk of leaf burn. " "What causes my rosemary to have what looks like slime in spots throughout my plant.? It looks kind of like tiny bubbles forming on the leaves and stalks. Like peroxide fizzing up!! Spots the size of a small to medium pea. Please advise me"
"I live in middle texas had a rosemary plant for over 10 years and it was always healthy until this year.It started to turn brown and within a little over a month it started dying rapidly. What would kill it so fast. There were no bugs or mold or any sign of what killed it. We did have a very wet spring but our property did not flood so Im at a loss and woud like to plant another one but don't want it to die if there is someway to protect it.... In all the years I had it never had dead branches on it nor did I put any chemicals on it... Im at a loss. Anyone have any ideas... "
"Judy, I suspect the plant died from a root rot disease that developed over time. This happens with many perennials, especially in warm climates with lots of moisture. Enjoy choosing a new plant, but do grow it in a fresh spot. " "First check to make sure you do not have some type of "spittle" bug -- insects that cover themselves with foamy slime to hide. My next guess is that the plant is desperately trying to rid itself of excess water. " "Hi I am from Mackay Queensland Australia; my rosemary, Thyme and Lavender they all get this disease the leaves on the branches go grey and black and eventually die, there is no sign of bugs on them. Emmanuel Vella." "I live in Northeast Florida Coast near the Georgia/Florida boarder. I had a beautiful, 3 foot plant which I kept outside in a pot. In the winter if frost was coming, I would cover or bring it inside. for several years it would grow. At the end of the summer, I noticed that it had begun to flower on all the new growth. I cut these off since I had heard that if it went to seed it would die. Well in the fall, I noticed that it had all turned brown and looked dead. Knowing that some may come back, I cut it back to about foot and hoped it would come back in the spring. Just want to know if this is possible or should I just pull it up and start a new one. It is still winter here although the temperatures are mild here. Is there any hope for my beautiful plant." "Roberta, you can wait and hope, or buy a new plant while rooting cuttings from your old one. Sometimes sudden cold injures one side of a rosemary plant, so that when it recovers it is lopsided. If the poor dear does leaf out, I would root some cuttings from it and then let it go." "I thought I was led to this site to find new thoughts on slugs! It was interesting reading about rosemary but it certainly was NO T about slugs. was that a deliberate heads-off? " "Hi Nina, we do have articles and pest guides about slugs on GrowVeg - just use the search box at the top right of this page to search. We've no wish to bring gardeners here under false pretences, so if you believe you were led here in error, please email us at info@growveg.com to let us know and we'll get it sorted." "I live in north florida . Very hot and humid . I have had two rosemary plants die . They turn brown and the leaves stick together as the plant is dying It is a slow process but nothing I have done seems to makes any difference .Any suggestions ?" "Humid conditions like you have in North Florida can lead to mildew problems on rosemary, especially with older plants. I suggest rooting cuttings each spring so you always have young plants coming along, and hope for the best. Tarragon does not seem to have this problem and may do very well for you there. And you can grow ginger, too! "